This morning our Retired Ministry Fellowship had an end-of-year function at East Geelong Uniting Church - about 25 of us, with small gifts for each one, ( I wrapped up necklaces, one from a Maldon op-shop!) morning tea, Advent hymns, a catered lunch (which I missed because of the book-club lunch) and an excellent devotion based on the Jesse Tree, beautifully organised by Margaret and Malcolm Campbell. This is a lovely group of mainly elderly men and women who have worked in ministry up to retirement and I have known most of them for many years. They are kindly people, interested in how I am going after Peceli's death last December. 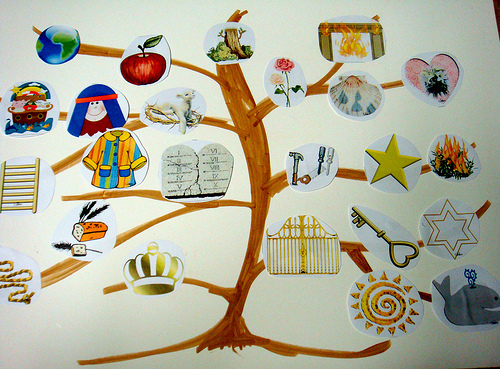 I didn't take the camera but this image gives you the idea of a Jesse tree which uses symbols to tell the story leading up to the Christmas Nativity. Geelong Brioche Cafe & Catering is in the Heart of Newtown offering beautiful coffee, food and catering. Come in for a bite or drop in for a catering quote. We occasionally go over to Eastern Cemetery - two minutes by car from home - to tidy Peceli's grave and put down some flowers. It's located in the grass section, no large stones, and a flat metal plaque will be placed there by Christmas. At the entrance via McKillop Street we are greeted by this lovely statue of an angel. I usually don't like statues like this nor all those stone carvings and blocks, but I think this one is nice. This late winter, early spring has seen stormy weather and very little sunshine in Geelong, and at times damage to roads, houses and trees. After sunshine came the wind and the rain. During our concert the lights flickered a few times and we thought they would actually go out, but of course the band could have played on! A huge pine tree came down in nearby Eastern Park yesterday,. 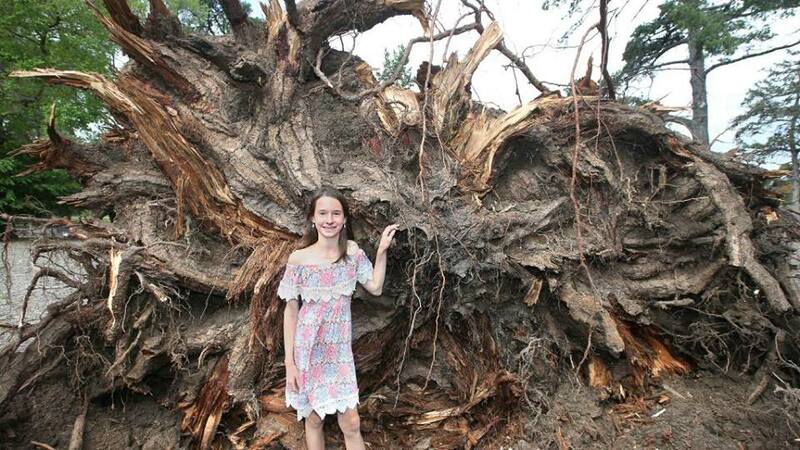 Jessica Michels takes a closer look a fallen tree in Geelong's Eastern Park. Picture: Glenn Ferguson. BUILDINGS were damaged, trees felled and power lost at thousands of homes after strong winds whipped Geelong on Sunday. A pleasant sunny stretch gave way to wild wind gusts of more than 70kmh, as the temperature dropped from more than 24C into the mid-teens. Buildings in Lara and Geelong West, including a Pakington St menswear business, sustained damage and trees came down across multiple suburbs. The State Emergency Service was called to a gum tree that fell on a home in Ocean Grove, while a roof began lifting off a shopping centre in Torquay. More than 4200 homes in Leopold, Moolap, Newcomb, Clifton Springs, East Geelong, Hamlyn Heights, Drysdale and Whittington lost power as the cold change swept through from 3pm. Power to the 1447 affected homes in Leopold were restored within half an hour, but outages in other areas dragged on longer. A fallen pine tree also blocked Holt Rd in Geelong’s Eastern Park. Geelong State Emergency Service duty officer David Brown said units had been called to half a dozen incidents but none had been severe. Sunday’s wind also raised dust levels, with the Environment Protection Authority warning that poor air quality would potentially continue into Monday. Strong winds are expected to continue across the Geelong and Surf Coast region today, with possible showers and hail. Rain is also likely to fall in the region on Melbourne Cup Day, with a top of 18C expected. A knowledgable young man has fixed my account so now I can post again, so I'll write something soon.